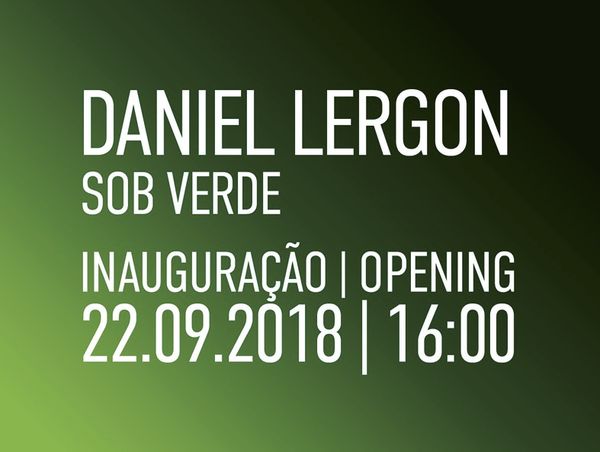 “Sob Verde” at Lehmann + Silva is Daniel Lergon first solo exhibition in Portugal. He was born in 1978, in Bonn (Germany), and since the beginning of his practice at the Universität der Künste (UdK) in Berlin (with Professor Lothar Baumgarten), Lergon has been interested in colour, the interaction of light on different surfaces and optical mechanisms. Since 2006, Daniel Lergon has exhibited throughout Europe, mainly in France, Belgium, Sweden, Spain and Austria. At Lehmann + Silva in Porto, he is presenting his most recent works “Sob Verde (Under Green)”. In the main floor, a series of works in a glowing yellow to dark green, complemented by a lighter turquoise hue in downstairs project space. As in his last exhibitions (“Multimono”, “Spektrum”, “Unter Grün”, “Excited State”, “angeregt”), Lergon works with only one colour, a phthalo green pigment in oil. This specific green is emphasized by means of the varying density of its application, whereby its effect is considerably dependent on whether it has been applied to neon-yellow ground, as in the works exhibited in the upper flower, or a white ground, as seen in the lower floor, in his new paintings. As Peter Lodermeyer wrote “we as viewers can scarcely believe that this is really only one single colour at work in these paintings. Regardless of how they look initially, the darkest parts are in no way black, but rather a deep, velvety dark green. One of the material characteristics of phthalo green is that, depending on the manner and thickness of its application, it produces an unusually broad spectrum of brightness gradations ranging from the aforementioned near-black when it is applied as impasto to a poisonously glowing, blue-tinged green hue when it has been heavily thinned. Lergon works out the possibilities and various colour shades of the painting material, “opening” the colour, as it were, by spreading out its wealth of nuances. Green is a color we almost inevitably associate with plants, nature, and the landscape. But the phthalo green Lergon uses seems oddly cold, introducing into the notion of nature a certain alienness, an emotional dissonance, that is difficult to describe in words. The reason for this is certainly the fact that the phthalo green has been artificially produced as a pigment, namely from copper phthalocyanine. It was developed by the chemical industry, and has only been in production since 1938. If we take a look at the complex formula of the chemical structure, we see that at the center of each molecule there is a copper atom, which is surrounded by rings of sodium and chloride. Thus, the color material with its copper component is also chemically related to Lergon’s earlier works on a copper ground. The sheer presence of the strange coloration of the phthalo green invariably conjures up certain concrete notions on the part of the viewer. For example, we might associate the works upon a white ground with underwater worlds, and those on a neon-yellow ground perhaps more with the northern lights, and thus with realms of nature that are mostly hidden from the human eye. The natural artificiality or artificial nature of these image worlds that Lergon opens up with his phthalo green paintings brings viewers into an emotional conflict between fascination and alienation. The multitude of forms revealed in these paintings gives continuous cues for figurative interpretation: At times we think we can discern plant and animal figurations, perhaps calyxes, tentacles, leaves of creeping vines, or seaweed or maybe also wings and legs of animals and, here and there, even indications of human bodies, but ultimately such attempts fail to establish a consistent pictorial quality within the individual painting. While viewing, the motifs always oscillate between fragmentary figuration and the mere trace of the painting process recorded in the painting substance. One of the fascinating aspects about these paintings is that as viewers we come to no end.